Spring is here... It has been playing mean tricks on people but it's here!! Well, at least in my area it's here! And my lawn is growing like crazy and my backyard is in need of some major trimming!! But with all this growth comes all the beautiful wildflowers. I love wildflowers so that's a major plus! Speaking of plus... I've been meaning to make another matted journal! I didn't forget, I promise just ridiculously busy! Who would've known that the creative life could be so busy??!! So, here it is, finally!! 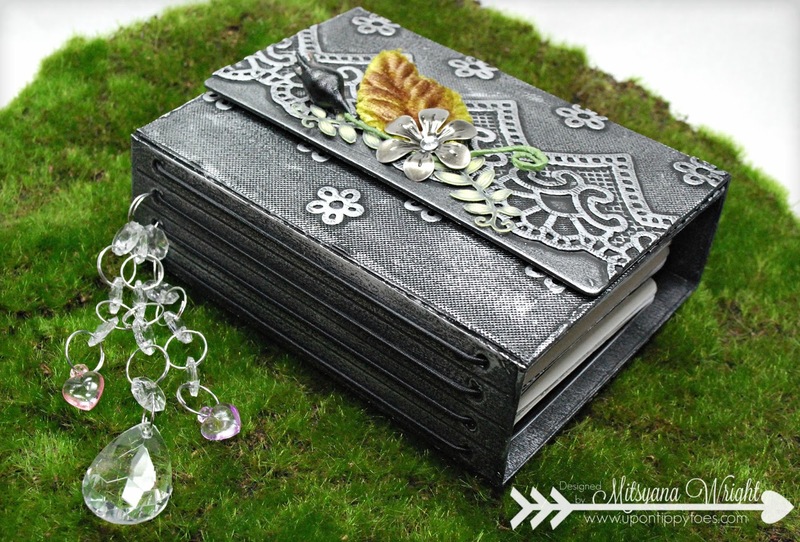 And it's a WRAP AROUND JOURNAL TOO!! 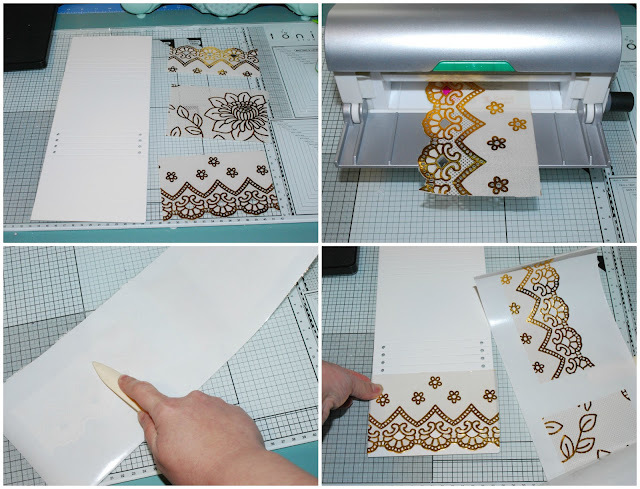 I started with die-cutting a piece of Sizzix Mat Board using Eileen Hull's Wrap Journal and a Big Shot machine. This is an XL die, so you'll need extended cutting plates. The cutting area is also VERY LONG! It cuts the mat board from end to end! I did not die cut my plastic mat. Instead, I cut it into segmented panels. The only piece I cut to exact size was the center panel. I wanted the texture of the mat to completely cover that center piece. But the two end flaps I just made sure that scalloped edge was incorporated onto that area with a bit of a gap to the edge. Then, I ran the table mat through my Xyron Creative Station Lite. Then gave it a good burnishing with a bone folder before peeling it off and applying them to my mat board. Once it was applied to the matboard, I trimmed off any overhang with a pair of non-stick scissors. 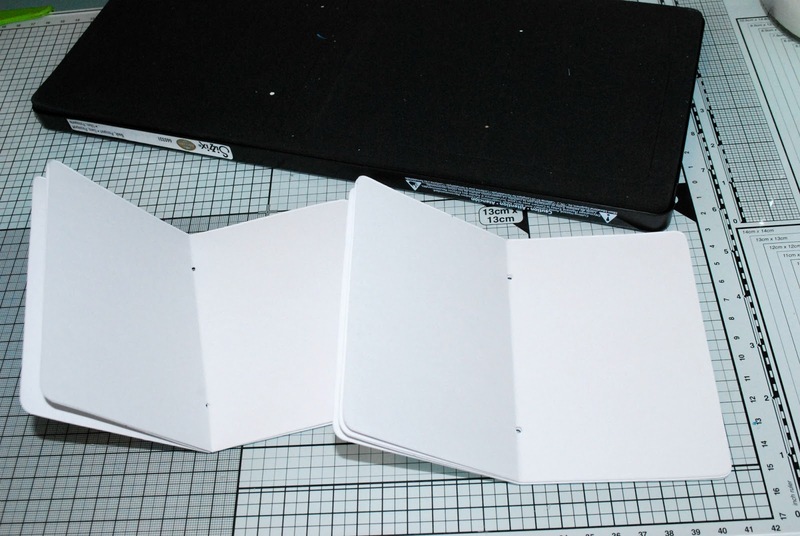 Next, I cut my inserts and pages. I found that Eileen Hull's Passport Die's pages fit PERFECTLY! And because it's a steel rule die, I was able to cut multiple pages at a time. I cut a combination of white, black, cream, and patterned papers to make my inserts. 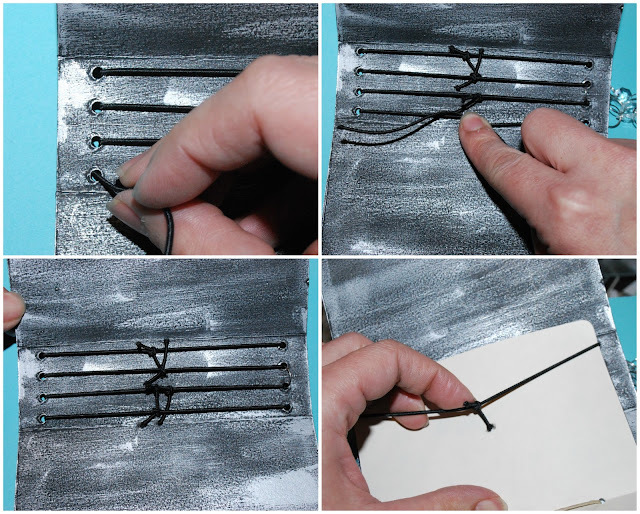 I strung them together with just a little bit of twine tied into a basic knot. Then set them aside. 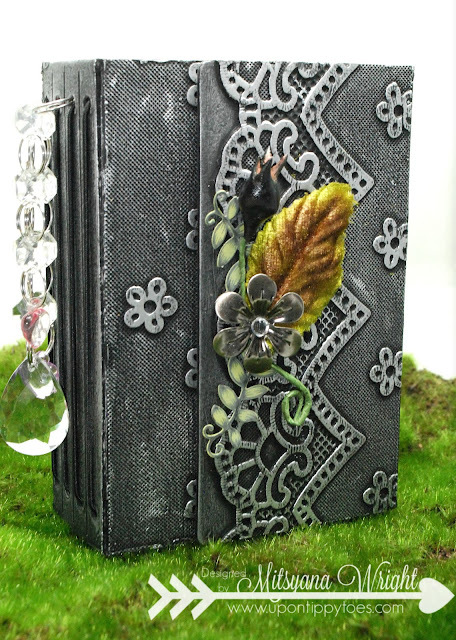 I covered the front of wrap journal cover with black chalkboard paint. 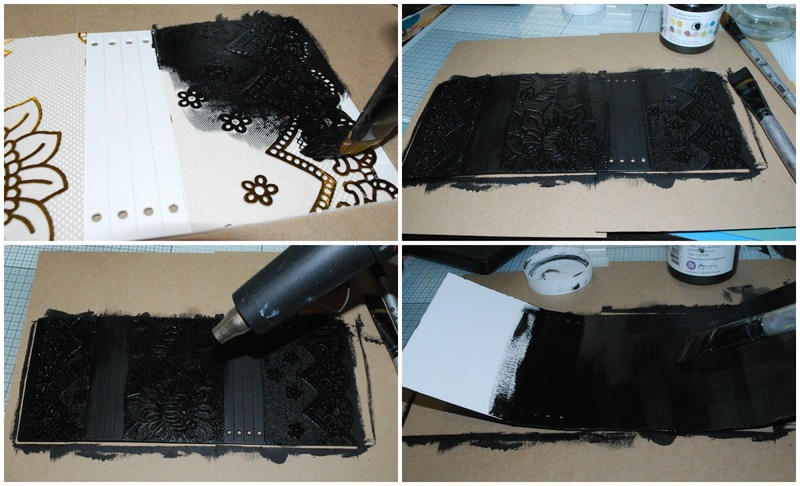 I heat set it to speed up the drying then flipped it over and painted the back (inside) of the cover. Using my finger as an applicator, I rubbed Pebeo Guilding wax over top. it really made all textured details pop! I string elastic through the spine of the journal cover. These are to hold the inserts in place. I didn't do anything fancy, no fancy weaving in and out, just a single strand through each pair of holes tied together with a basic knot. I trimmed the excess off and slid an insert under each elastic band. I tied some beaded charms down the spine. I used a jump ring to anchor them to the two center holes. Then, added a double magnet closure. This will ensure that the wrap journal stay closed and secure. Here's a little peek at the inside of my journal. I didn't want to take away from all the beautiful texture so I" kept the embellishment to a minimum with a just a small leaf, budded stem, and metal flower. And here is my finished Wrap Journal. Mother nature is playing games this year and can't seem to make up her mind. A lot of my friends still have snowfall. That is just insane!! And the weather here,...we'll have sunshine and 80 degree temps one day and severe thunderstorms and flash flood warnings in effect for the next. Seriously, with screwy weather and temps fluctuating 40 degrees day by day (sometimes on the same day) no wonder people get sick! This journal reminds me of this years Spring... kind of dark but a little glimpse of green! I'm hoping Spring will be here soon for EVERYONE! I love snow but there's a time when all good things come to an end. Besides, flowers are better than snowflakes any day!! Hahaha! Thank you, Tracy!! I love that wax!! It makes everything you put it on pop!! Amazon project as always Mitayana. the use of a table mat is genius! I’ve been meaning to get a creative station and this was the final ouch I needed. I love what you do with plastic mats girl :-) Never would have thought of the chalkboard paint and wax treatment!